Midway through the fourth quarter, with Seattle down seven and driving, Russell Wilson was picked off by Jayrone Elliott on an attempted screen pass. But Elliott coughed up the ball, and after the pile-on was cleared, Seahawks tackle Justin Britt came up with it. Packers ball, the officials said. Carroll would love to know why and how. The explanation’s easy, if unsatisfying: the pile on a loose ball is basically Battle Royale. For all of football’s gargantuan rulebook and the clarity afforded by replay review, there’s just no way to police what goes on at the bottom of a scrum, and no way to ensure that the player who has the ball when officials finally uncover it came by possession legally. Biting, choking, punching, gouging, testicle-squeezing...anything goes. It’s not ideal, but it’s also not fixable. And the only feint toward fairness is the notion that it’ll even out over time. Which isn’t much consolation when it happens to your team in the fourth quarter of a close game. 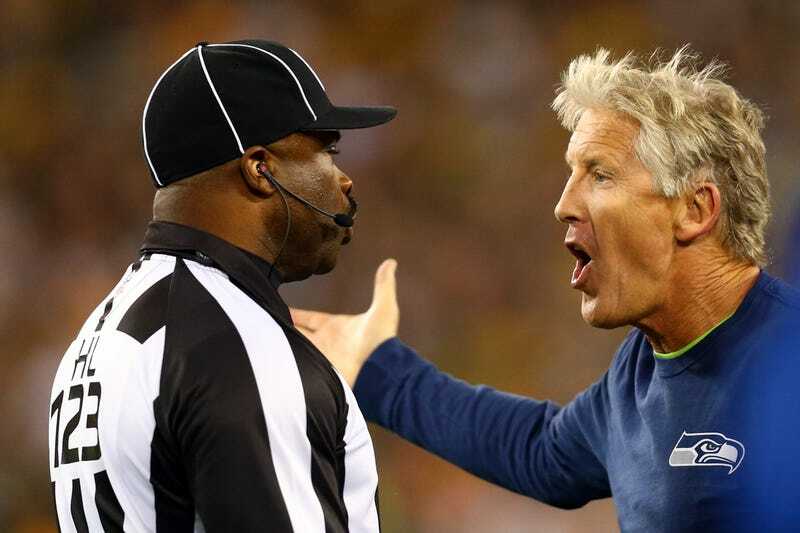 Anyway, please enjoy angry Pete Carroll.